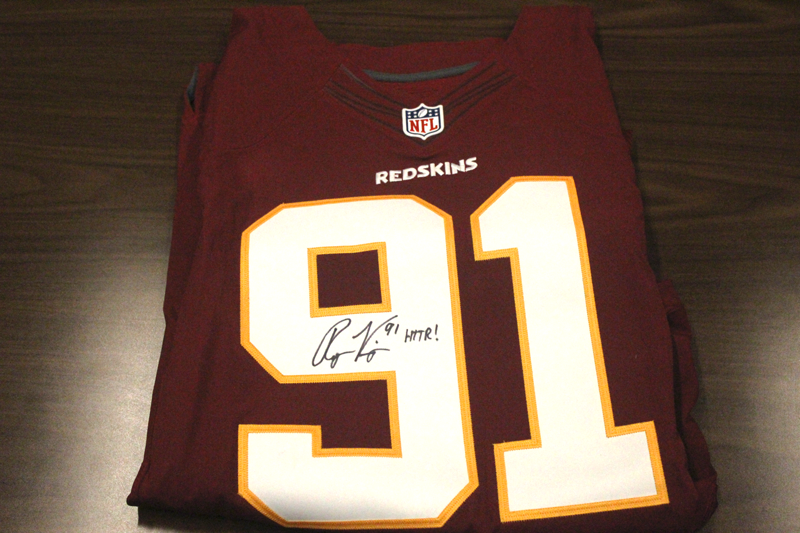 Pediatric Specialists of Virginia (PSV) is proud to announce that Washington Redskins’ star Outside Linebacker, Ryan Kerrigan (#91), on behalf of his foundation – Ryan Kerrigan's Blitz for the Better Foundation – has provided an official autographed game jersey to raffle off during our STRIDE FORWARD 5K Run/Walk and Family Health Fair Event on Sunday, September 27 at the Reston Town Center. We will be selling just 100 tickets during the 5K Run/Walk and Family Health Fair. You must purchase raffle tickets starting at 9 am during the event but you do not need to be present to win. The ticket prices are set at $20 per ticket or $50 for three tickets. The raffle drawing will take place promptly at 11:45 am for all ticket holders. The winner (if present) will be given the signed Ryan Kerrigan jersey by PSV and their photo will be taken and placed on PSV’s Facebook page and Twitter account. Register now for the PSV STRIDE FORWARD 5K Run/Walk.